TRI for Power Plants is a powerful, user-friendly tool for estimating, tracking, and reporting releases of chemicals-primarily trace substances-from fossil-fired steam electric plants. The spreadsheet-like tool has been applied by numerous energy companies to increase the efficiency and reduce the costs of TRI-related analyses while enhancing compliance with changing reporting requirements. The software uses a mass balance approach based on fuel input and plant configuration. Fuel inputs include coal, oil and gas, and alternative fuels. The software incorporates emission factors from the client’s "Emission Factors Handbook," as well as data on fuel and ash composition from the client’s chemical emissions database. The software calculates emissions of reportable chemicals to air, land, and water, and checks to see if the TRI reporting threshold has been exceeded. A separate module, Merge, allows direct transfer of TRI for Power Plants calculations into the EPA TRI-ME reporting software. The software package TRI for Power Plants was developed by Tetra Tech for the client with substantial user involvement. 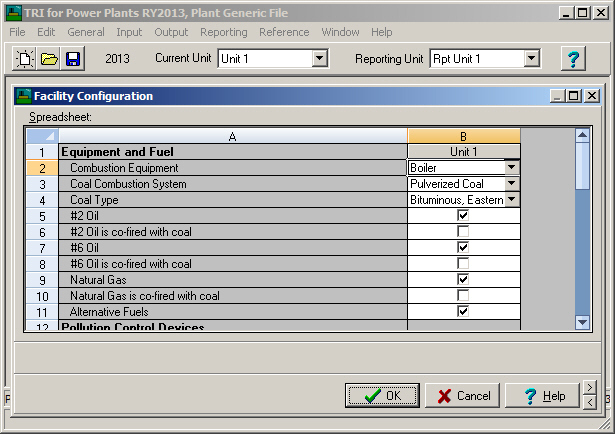 It provides an easy-to-use program to generate required Toxic Release Inventory (TRI) data reports for use by utilities. These reports are required under the Emergency Planning and Community Right-to-Know Act (EPCRA, Public Law 99-499, Title III of the Superfund Amendments and Reauthorization Act of 1986, hereafter EPCRA Section 313) and Section 6607 of the Pollution Prevention Act (PPA). An EPA rule-making (62 FR 23834, May 1, 1997) determined that electrical generating facilities that use coal and/or oil must comply with the reporting requirements.